Bucks Run’s second is a 426 yard par 4. Teacher’s Comments: Up North experience for half the drive. 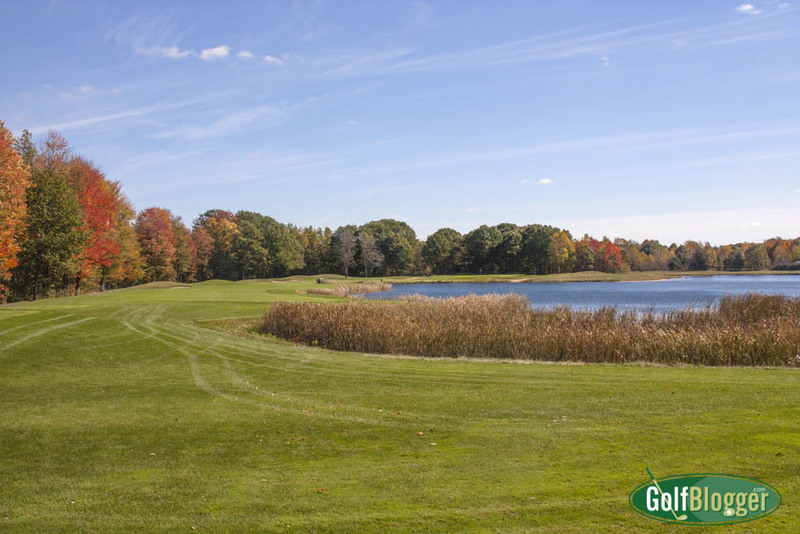 If you are longing for an Up North Michigan golf experience, but don’t relish the drive, try Buck’s Run. 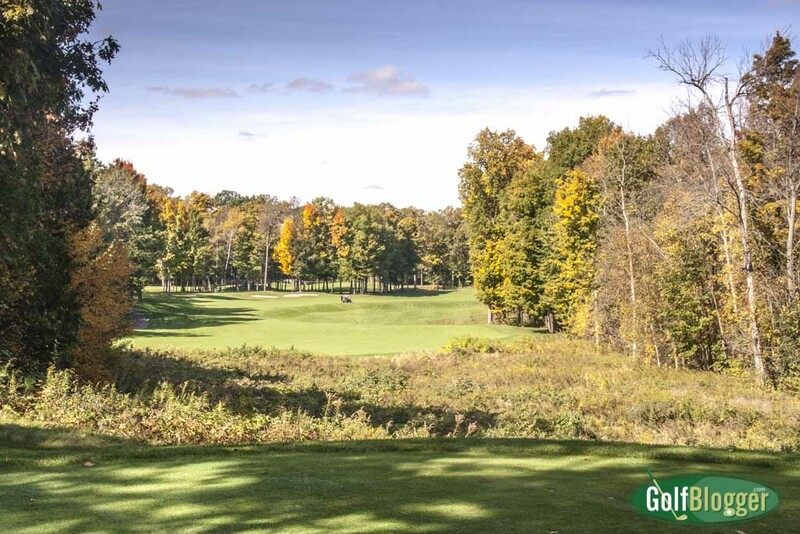 Located just two hours from GolfBlogger World Headquarters in Ann Arbor, Bucks Run has all the Way Up North Michigan golf hallmarks: a “big feel”; wide, tree lined fairways; elevation changes; and isolated holes that can make you feel as though you’re the only group on the course. There’s a lot of variety at Bucks Run. Half the holes have water in play. Five turn right; five left. Fairway bunkers on twelve of the holes offer challenge off the tee. Half the holes have forced carries. Significant elevation changes occurred on five holes. Architect Jerry Matthews offered a little bit of something for everyone. Bucks Run has four sets of tees: Black, White, Gold and Red. From the back, Bucks Run stretches to 6, 765 and plays to 72/130. The Gold Tees come in at 5, 861 and play 68.2/124. Play it forward and have some fun. My favorite hole was the 464 yard par 4. From an elevated tee, it plays downhill on the tee shot, then uphill and slightly left to the green. An angled bunker on the right side of the fairway keeps longer hitters honest; a wayward ball left rolls downhill and gets lost in tall fescue. The serpentine fairway slithers in and out, twisting and turning as it goes. This can be a birdie hole if you put some thought into where you want to land your shots, and the execute. Study this hole carefully on first play. The par five sixth (see photo above) offers a terrific example of the “Up North” feel that Bucks Run offers. You could swap that hole with any in Gaylord, Charlevoix or Traverse City and not miss a beat. From an elevated tee, the relatively narrow fairway follows curving shelf on a hill to the green 526 yards away. Conditions on the day I played were good. Greens and tee boxes were in good shape. There were, however, bare spots on some fairways that I would not have expected from a premium course. A couple of things kept this course from top honors. First, there were several holes that just didn’t interest me. The uphill par 4 13th was dull: Hit the ball as hard as you can uphill, then hit it again uphill. I’ll also single out the ninth and tenth as holes that didn’t produce a spark. Second, peak summer rates are a little on the expensive side. Midweek, with a cart, greens fees are $85; that goes up to $95 on the weekend. Walkers are encouraged, and get $15 break for playing on the hoof. Finally, I found very slow play on the day I visited. That’s surprising, because it was a chilly fall day — after the peak season. If that’s how it is off-peak, I am not sure I want to play at the height of summer. All that said, I think this is one of several great choices from mid-Michigan and parts south that offer that “Up North” Michigan golf feel. 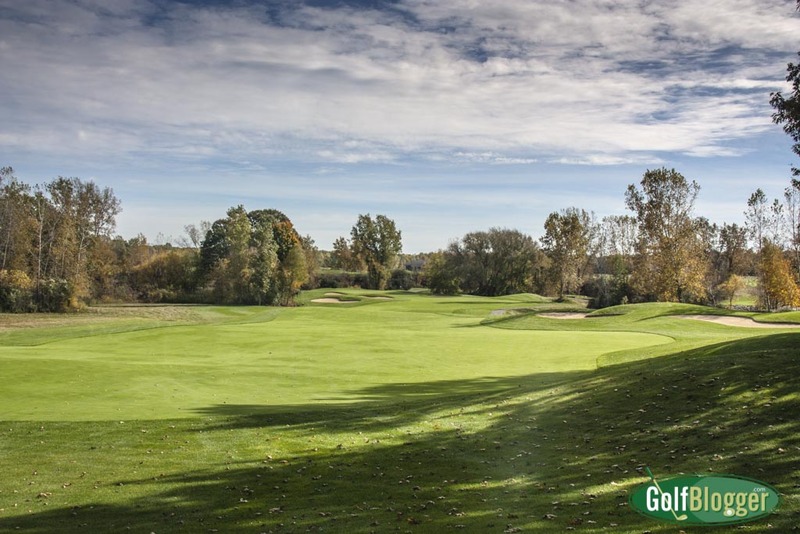 The Bucks Run Golf Course Review was first published December 1, 2015. Bucks Run Hole 2 Bucks Run’s second is a 426 yard par 4.